I'm so excited to be here today and announce that I am the Guest Designer for City Crafter Challenge Blog! I just love this blog, and I am really thrilled to spend the day with them today. 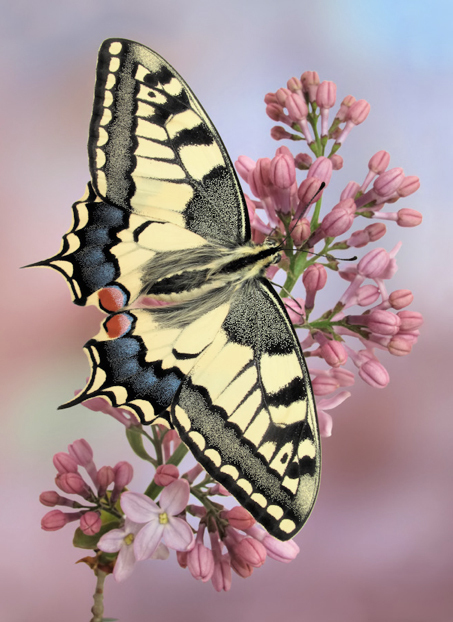 For this challenge - Week #228 - BUTTERFLIES, we were given a photo for inspiration. I will show you that in a second, but first here is my card. So here is the photograph they gave us. Isn't this just a gorgeous image! Boy, I sure had a lot of fun with this one! - for the background I first laid down some random splotches of home-made texture paste for dimension and then some DecoArt Crafter's Acrylic Tropical Blue and Cherry Blossom swooshed on randomly. While the paint was still wet, I sprtized the panel with water then tilted it to one side and the other until I got the look I wanted. - then I used a Prima stencil and some crackle texture paste to add some design. 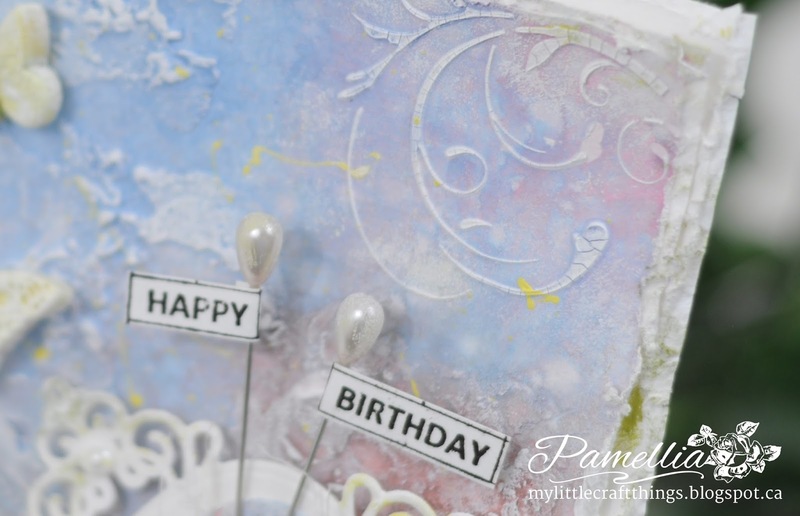 Once it was dry, I took some Tim Holtz distress inks Stormy Sky and Victorian Velvet (diluted and put in mini misters) and sprayed the textured are areas so it would dry in the grooves. Then I highlighted the raised areas with some dabs of white paint. - the butterfly is from Kaisercraft, stamped with VersaFine Onyx Black ink, coloured with Copics and then I added some pretty yellow glitter (from the dollar store). 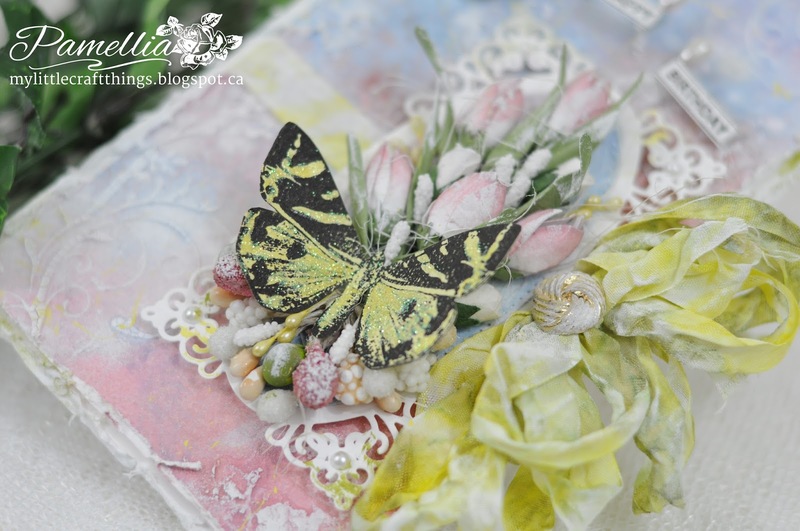 - the butterflies were handmade from polymer clay and a Mod Melt mold. I covered them with Ranger Picket Fence crackle paint, then rubbed distress stain Forest Moss into the cracks, then highlighted them with white and yellow paint. - the die cut panel is Spellbinders Radiant Rectangles, the foliage is Spellbinders Foliage, and the sentiment is from Heartfelt Creations - All Seasons. - the flowers were handmade with a poinsettia die and coloured with Tim Holtz distress ink Victorian Velvet. The ribbon was coloured with Tim Holtz distress ink Squeezed Lemonade and Memento ink Pistachio. Aahhh, thank you so much Samra, for the lovely compliment and for being worried! Wow - This is so pretty! Fabulous details too!! Excellent job! Beautiful Pam!! I love the matching butterfly! Gorgeous and we love having you this week!! This is what I call shabby chic gorgeousness. Beautiful pastel colours, butterflies <3 and a feminine touch. Amazing! Wow ! where do you get your ideas from ? , this is stunning your background looks fantastic , your flowers and ribbon look so shabby and the lovely butterflies are just so gorgeous . OMG this is AMAZING!!! The image you drew inspiration from is fabulous and you certainly 'hit the nail on the head'!! WOW ... such a beautiful card! And I just LOVE how you did the sentiment on the pins ... how creative and delicate to go with the beautiful floral cluster and butterfly! Awesome job my friend and thanks so much for stopping by my blog and leaving such kind comments! Have a fabulous week! Very beautiful Pamellia and I love the crackled butterflies. Lovely colours used. absolutely stunning!! So happy to have you with us this week at CCCB!! I am beginning to have a problem with you Pamellia.....you are testing my use of the English language to describe your creations!! Wow and stunning and beautiful are not enough anymore. This is sooooooo perfectly pastel and floaty,you are some artist girl,seriously. I hope you are proud of this one...and yesterdays one....and all of them!! 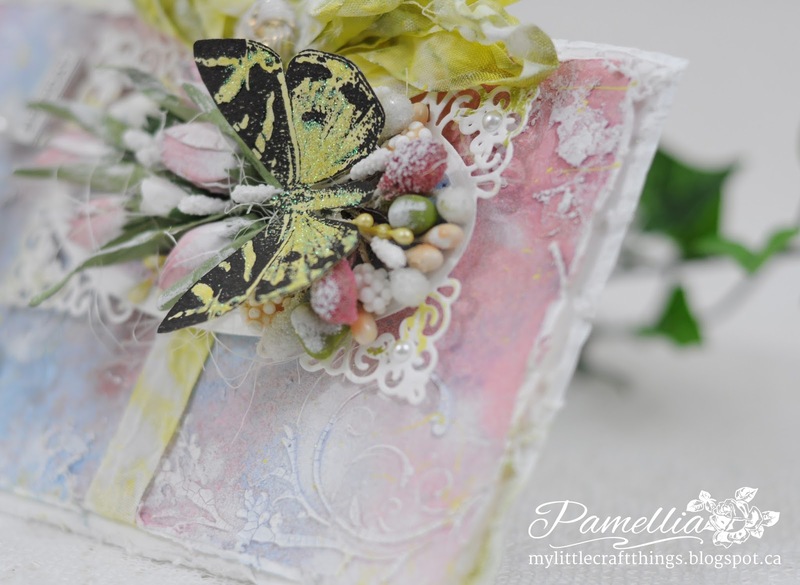 A stunning mixed media piece Pamellia. Love the pastel colours and textures. Thanks for joining us at 613 Avenue Create. Great card, Pamellia! Your project will be featured on the 613 Avenue Create Facebook page today at 2:00 pm EDT US. Really quite lovely. Congratulations on your Guest Design spot Pamellia. Your card is gorgeous, I always love the texture you create on your cards and fabulous dimension and details. Congratulations on your CCCB spot and so nice to learn more about you. Your card is absolutely beautiful, especially the arrangement of flowers topped with the butterfly. A beautiful card, the gorgeous butterfly is so like the one on the sketch. This is gorgeous Pamellia! I love the pastel colors and all of your beautiful butterflies, the sparkle looks fabulous! Congrats on your GDT spot too! Another vision of loveliness. The butterfly looks almost identical to the photo, how cool! Also, love how you've attached the sentiment to the stick pins. . . genius! PS . . . . .tulips from a poinsettia die? Who'da thought? Absolutely gorgeous, congrats on your GDT spot, they picked well, your blog is amazing and inspiring! I couldn't be happier to see you guest designing for City Crafter. Your card is very special, and full of detail. Love it! Hugs. oh this is somptuous!!! what a gorgeous project!!! 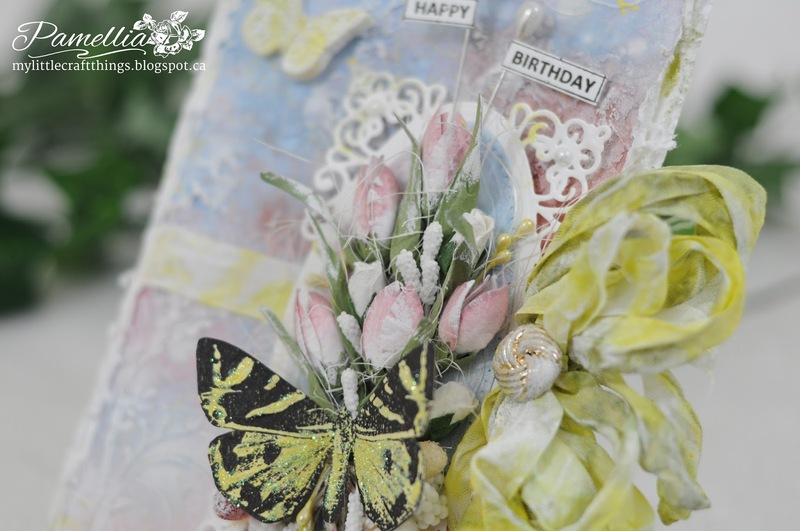 so glad you entered our "let's fly away" challenge at love to scrap! Love your style!! Love this card!! Wow, you are certainly on a roll with all of these GDT spots - congratulations! :) Another beautiful creation, I love the pretty colours and your interpretation of the photo. The butterfly looks fabulous! Love this pretty card with its soft colour tones gorgeous take on the Summer chall theme. I am in LOVE with your background, Pamellia and your butterfly is just GORGEOUS! FAB ribbon treatment, too! This is so beautiful. 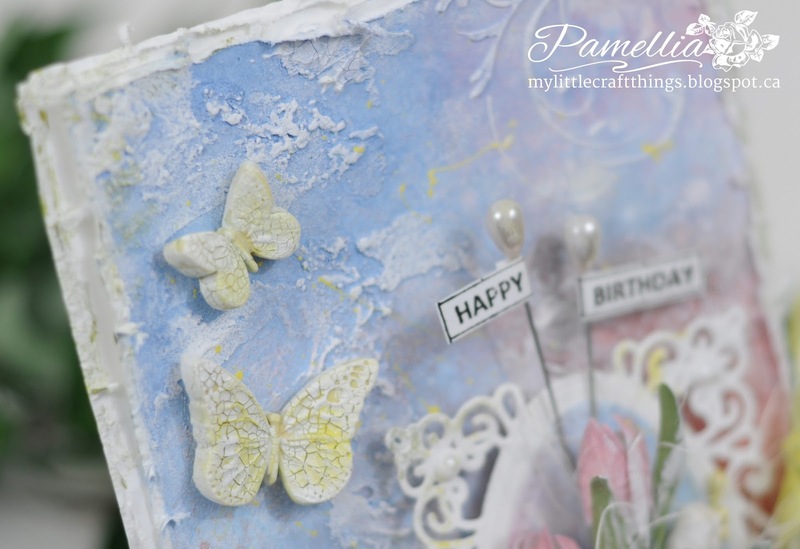 I love the pastel colors and all the fabulous elements of this card.